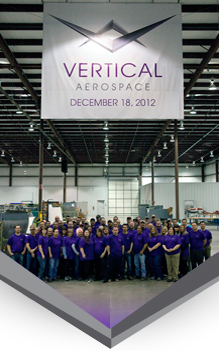 Vertical Aerospace is an aviation-centered company fueled by passion for aerospace technology. We endeavor to reach new heights in all aspects of our business through ingenuity, tenacity and entrepreneurial spirit. We foster an uncomplicated business environment built on respect and strength of character. We will build lasting relationships with our customers, employees, suppliers, and community partners. Our goal is to provide excellent service and the most rewarding customer experience in the aerospace industry. Vertical Aerospace provides airplane maintenance, repair and overhaul services to global partners in the commercial, military and related aerospace fields. We safely return planes and components to service and into airworthy condition through creative problem solving, the highest level of customer service and quality workmanship. We aim to consistently exceed customer expectations by maximizing efficiency and effectiveness. Vertical Aerospace values long-term partner relationships and we strive to make doing business with us enjoyable and easy so that our customers may reach new levels of excellence with those they serve. Service – Vertical Aerospace exists to serve customers with unparalleled expertise, efficiency and respect so that we may consistently exceed expectations. Passion - We are passionate about working in the aviation industry and are committed to making positive contributions to the field by providing high-quality products and services to our customers. Community – We are a dynamic partner in all of the communities in which we work, live and do business, and we look for opportunities to make a meaningful impact on those around us. Courage – We are courageous in our collective approach as a company and we value courageous decision-making, thoughts and actions in the individuals with whom we work. We foster a collaborative environment where people are valued for their positive contributions and ethical fortitude.